At the scale of western North America, the paleobotanical record appears to document a mass extinction of plant species over the time represented by a centimeter of sediment. Before 1980, temporal resolution of the rock record was coarse and no such statement could have been made with any sense of certainty. The K-T boundary provided a testable hypothesis that is still being examined. Our results seem to suggest that Traverse (1988a) was incorrect in asserting that all changes in floras throughout time have been due to gradual replacement. It now appears that it is possible for plants, like animals, to suffer abrupt mass extinction. The radiation of the angiosperms that began at the start of the Cretaceous was well under way by the end of the period some 80 million years later and most terrestrial ecosystems either contained or were completely dominated by angiosperms. The K-T extinction, while selective at the environmental scale as evidenced by the apparent preferential survival of mire plants, was not obviously selective at a taxonomic level. That is to say, no major plant groups disappeared at the boundary, and the damage primarily occurred at the species level as local ecosystems independently suffered the after-effects of the impact. Floral recovery from the event seems to have taken the duration of the Paleocene with the awkward exception of the Castle Rock rainforest, whose presence less than two million years after the event remains enigmatic. This leads us to the interesting question of whether the K-T event had a destructive or formative effect on entire biomes. Although the relationship of large dinosaurian herbivores to their associated vegetation will always be difficult to qualify, it is hard to imagine that they were not keystone species in some sense of the phrase. The disappearance of non-avian dinosaurs must have been significant for their environment. Moving forward, it will be interesting to search for more evidence of Paleocene rainforests to see if their occurrence is globally tied to the K-T event or if the Colorado occurrence is an isolated one. 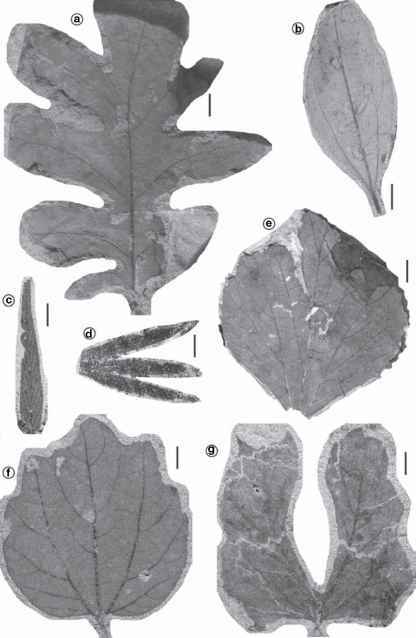 Clearly, the fossil record of plants at the K-T boundary, while strong in North America, is weak on other continents. The sections in eastern Russia and northern China have fossils but lack continuous outcrops and independent dating. The sections in Patagonia are promising but largely unexplored, and the floras of New Zealand await further collecting and analysis. All these areas need more stratigraphic framework and larger plant collections before they can contribute substantially to this story. The new discoveries in Colombia are perhaps the most promising because they occur directly on the paleoequator and promise significant information about the tropics. The potential for these areas is high if future paleontologists take advantage of the geologically unique K-T boundary impactite. This thin layer is perhaps the most precise and global time marker in the entire geologic record, and it is as much a tool for future research as it is the record of global devastation in the past.